And it is what they look at when they take a break. Protradecraft is at the fingertips of building professionals when they are looking for answers about construction, or just looking for entertainment. We deliver our PunchList newsletter to their phones every week. Links to Protradecraft articles and videos also go out daily (at lunchtime) in Professional Remodeler's 'Daily Post' email newsletter. Why do we focus on mobile phones and email newsletters? "53% of total email opens occurred on a mobile phone or tablet in Q3 2014. This is an increase from the 48% percent seen in Q2 2014." And that was waaaay back in 2014. Imagine how much that has changed in 2016! Most of our readers spend most of their day on jobsites. They are mostly remodelers (55%) trade contractors (20%), and architects or engineers (13%). Their skill level? 62% of them identify themselves as Master Craftsmen. We hear a lot about web readers being fickle and short-focused. ProTradeCraft readers don't roll like that. Experts say that articles for web and mobile should be short because online readers don't have the time, patience, or attention span to read long articles. ProTradeCraft readers don't roll like that. either. Sawzall Shootout: Head2Head Tool Test: 11minutes 18 seconds on page (average). 2015 Energy Code Update: 5 minutes 45 seconds on page (average). Airtight Walls From the Inside: 5 minutes 39 seconds on page (average). 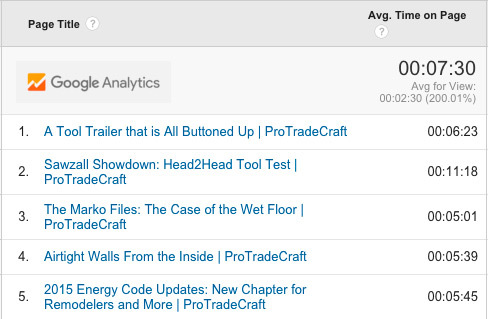 The average Protradecraft user visits one and a half pages per session, which is a little better than most construction websites, but if you strip out the tire-kickers, you see that the power users visit twice that. Power users (people who spend more than 2 minutes on the site) account for more than half of all page views. 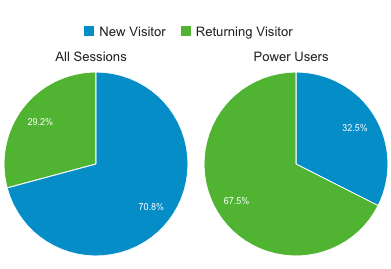 Power users of ProTradeCraft account for 67% of returning visitors. The highly engaged audience is also very loyal. That 32% of all new users are also new power users means that our audience is growing with more engaged users. Since launching the site in June 2015, we have slowly and steadily built a strong audience. And we like where the line is headed—up. For sponsorship opportunities, send a note to Adam Grubb.